A physical test is a norm and sometimes even a requisition while applying for a job or participating in an activity. The authority concerned performs a physical examination of the person against various parameters to deem him fit. In such cases, a physical form can really come in handy. Since it comprises of all the important parameters against which the person needs to be tested, the physical examination is simplified considerably. All that the examiner needs to do is fill in the details of the test. 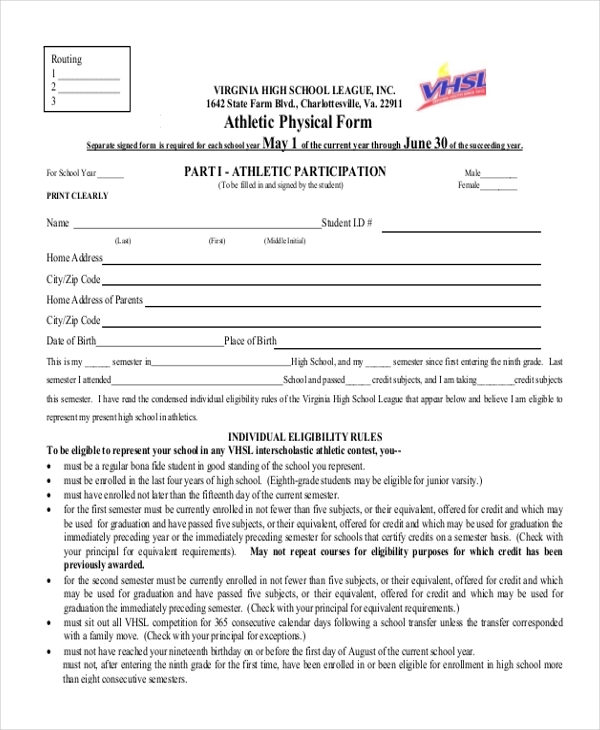 A sports club usually conducts a physical examination of a person before allowing him to participate in an event or enroll in a sports activity. The aforesaid form is used for this purpose and helps the authority the check the person against various parameters. 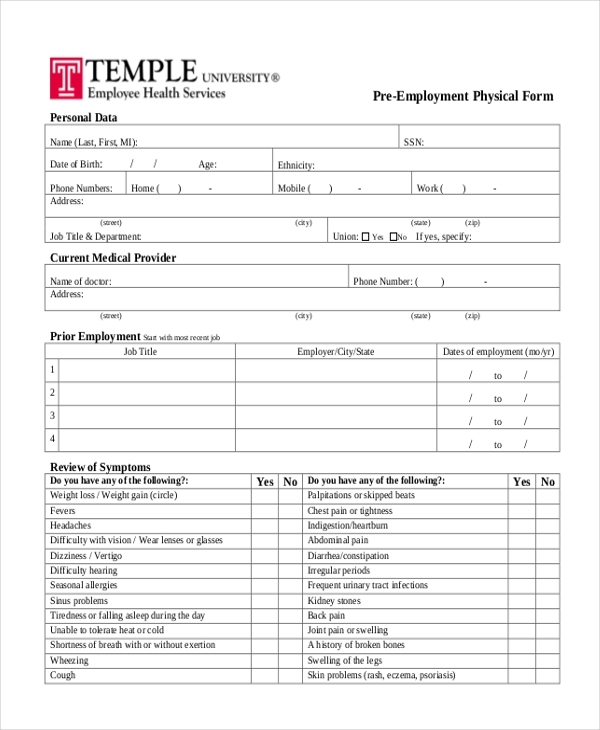 No matter what the need of the physical examination, this form works just fine for the purpose. It comprises of the important segments which ensure that the person is checked against all the required parameters. 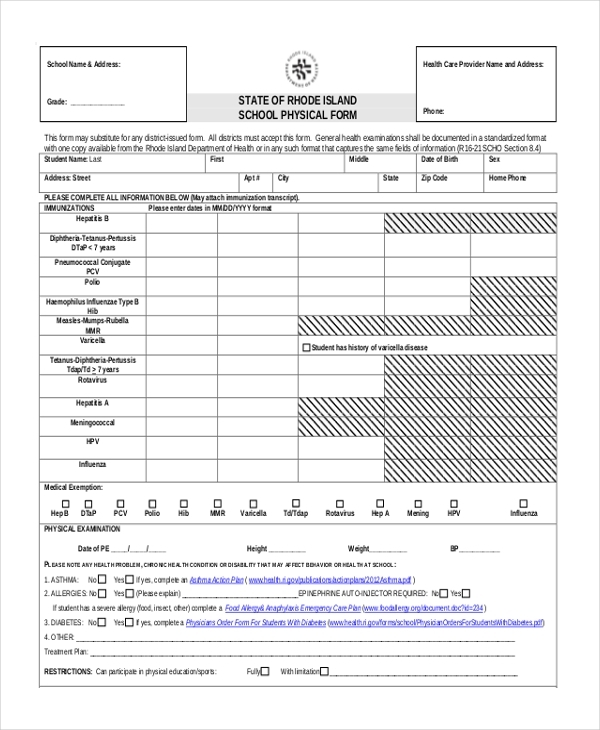 As the name indicates, this form is used by a school to carry out the routine physical examination of its students. The form contains various subheadings which give the examiner an idea of the different things he needs to take note of while examining the student. 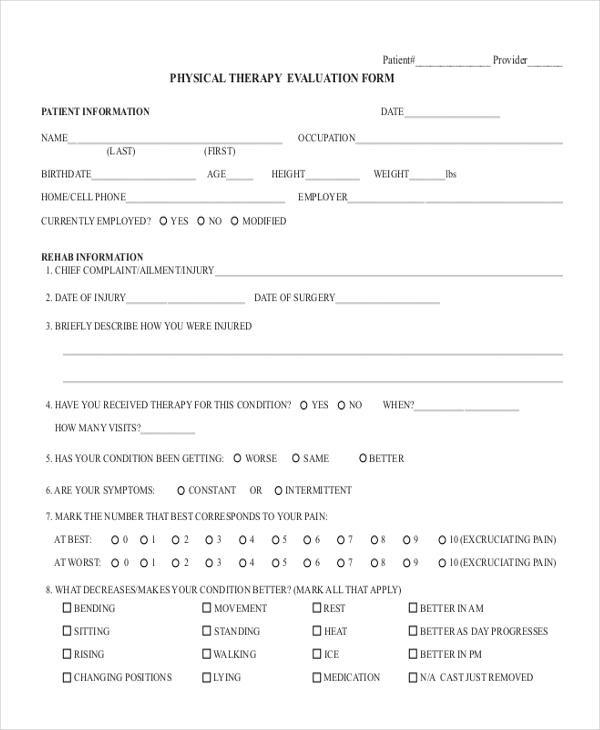 Hospitals and therapeutic clinics use this form to conduct a physical examination of a person before enrolling him for a physical therapy. The form is used to ensure that the person is physically fit to withstand the therapy. Organizations make use of this form to ensure that a person is fit enough to operate heavy duty vehicles and machines. 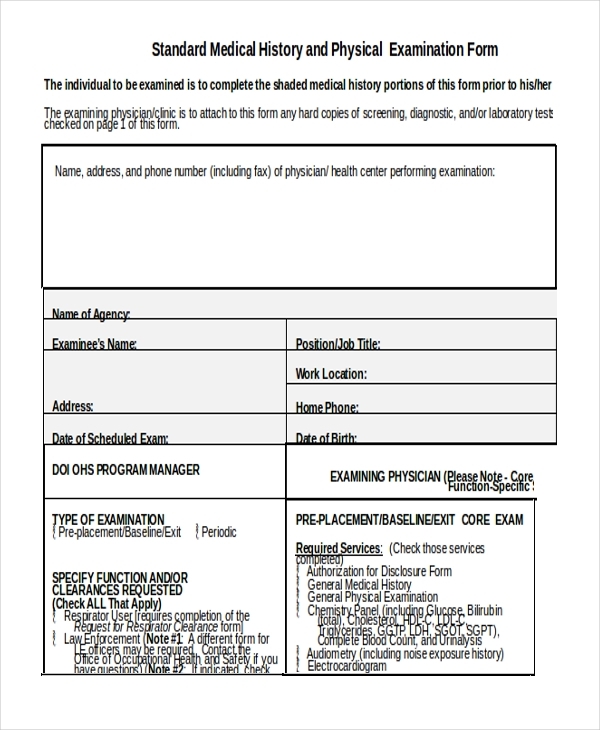 The form gives the examiner an idea of the parameters to be considered when conducting the examination. 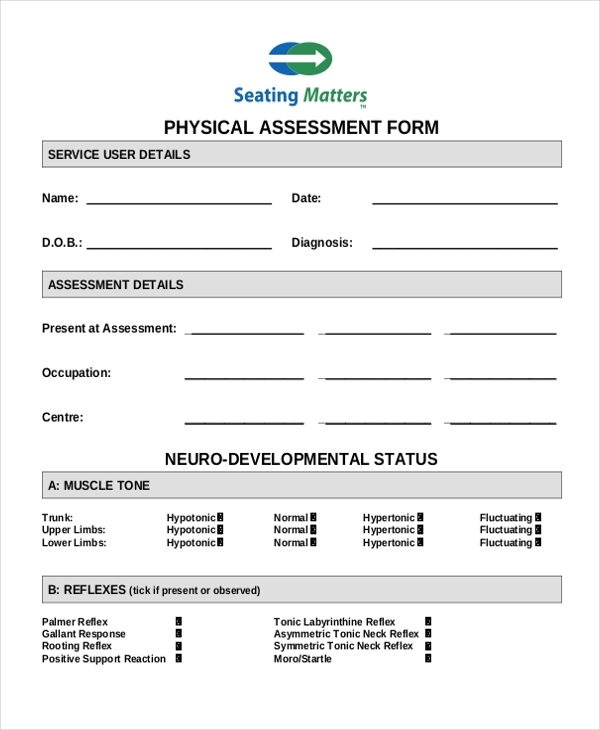 This form can be used by anyone irrespective of their reason for conducting a physical assessment. The form contains all the crucial elements required for such an examination. However, the user can further make changes to it. 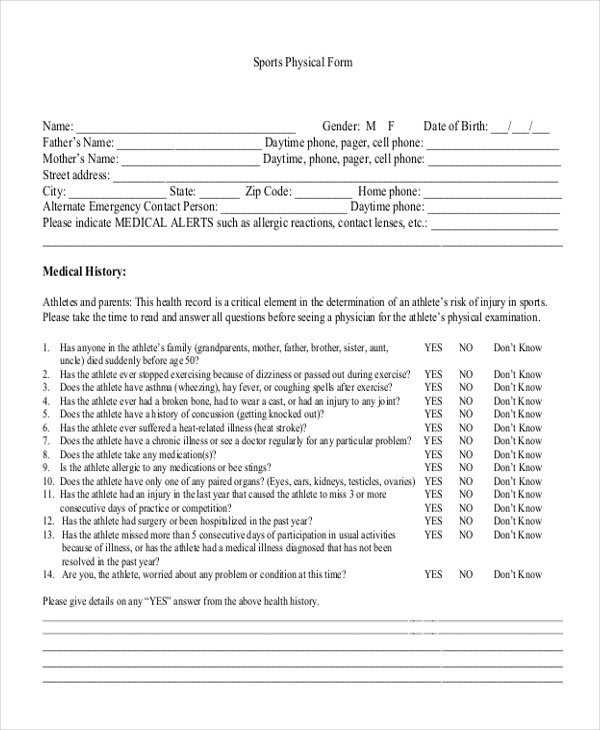 This is a sample of a physical examination form which allows a person to collect the medical history of the person before examining him. The sample gives him an idea of the format to be followed while designing such a form. 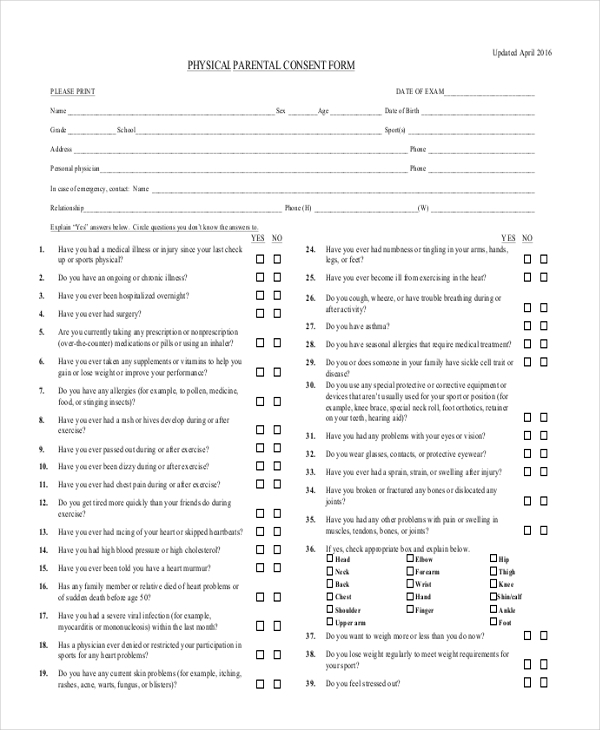 Business and service organizations use this form to conduct a physical examination of their prospective employees to ensure that they are fit enough to take up the job offered to them. 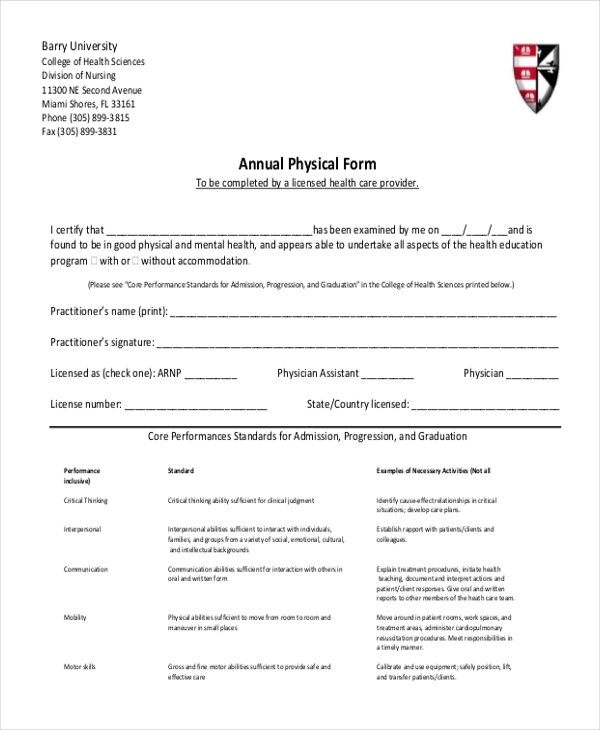 Organizations that conduct a physical examination of their employees on an annual basis can use this form for the purpose. With all the parameters in place, the examiner can easily conduct the test. 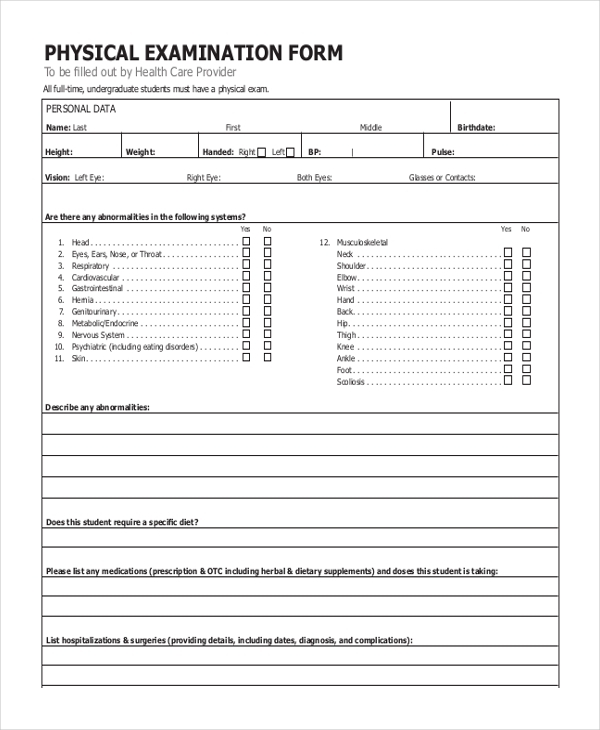 When a person wishes to request an appointment for a physical examination, the concerned authority or hospital offers him this form to give in an application. The person is required to fill in his personal details and the date most suited to him for the examination. 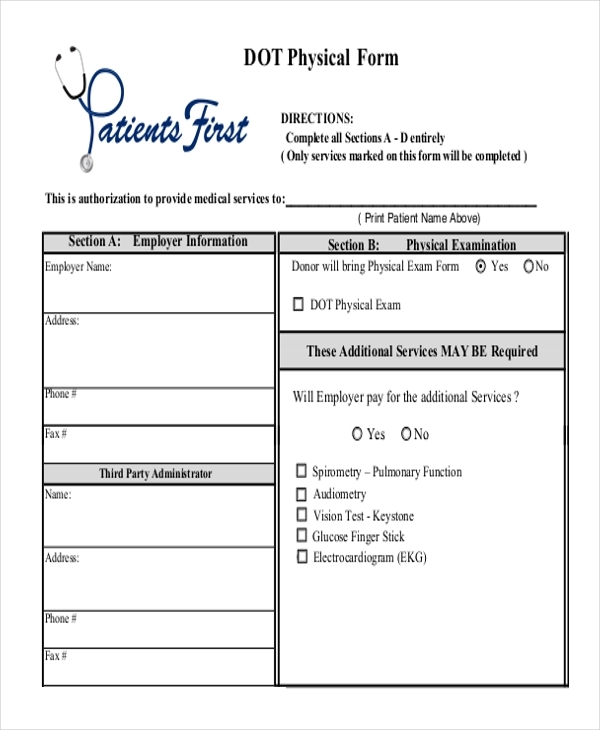 This is form is usually used to record the medical as well as physical details of a person. The form may come in handy while applying for a job or participating in an activity. Before participating in an athletic event, the athlete is required to undergo a physical examination to ensure that he is fit enough to participate in the event. The aforesaid form is used for this purpose. 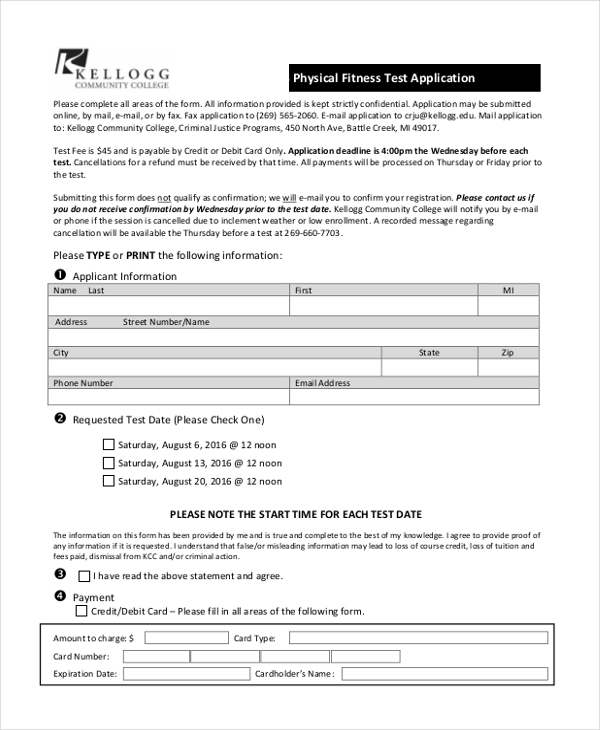 This is a standard format of a physical form and gives the user an idea of the segments and elements to be included when designing such a form. However, the user can make changes to it as per his needs. 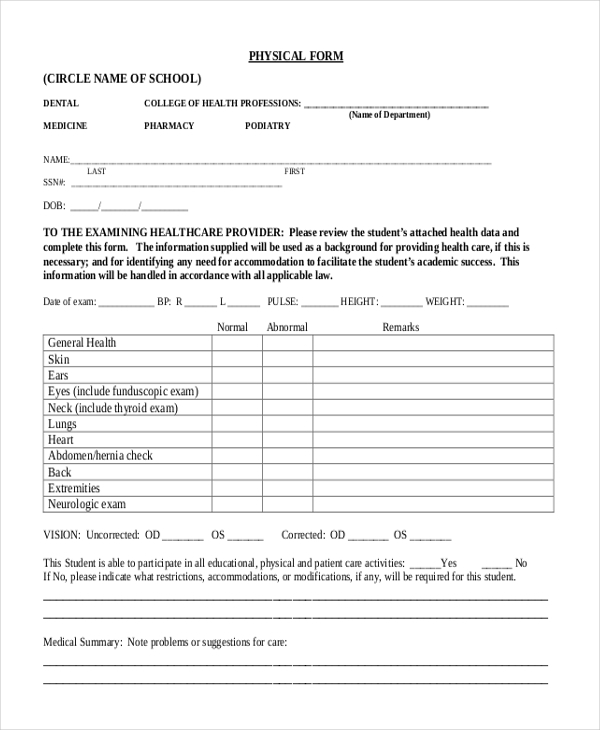 Educational institutions and sports club use this form to secure permission from the parents of the students to conduct a physical examination. What are The Benefits of Using Physical Forms? In case you are thinking of designing a physical form for your organization, it would be a good idea to browse through our collection. With a vast range of these forms to offer, you are sure to find one that is perfect for you. Easy to download and personalize, designing a physical form would seem like child’s play.